At the EMOT Hospital Spinal Surgery Department, vertabral fractures that happen after a serious trauma, Rheumatoid Spondylitis related to the deterioration of bone quality or structure, gibbus and vertabral fractures related to Osteoporosis (bone loss), degenerative problems related to arthritis that occur with the aging of the spine, congenital and developed scoliosis, curvature or kyphoses (gibbus), the treatment of congenital abnormalities related to the spine, spinal stenosis related to degenerative waist diseases, slipped discs (spondylolisthesis) and hernia surgeries are performed. Among the most important factors that contribute to the success of our clinic is having at our disposal highly experienced specialist doctors, an experienced nursing staff and a high quality physiotherapy team in order to prevent complications that may arise after these kinds of operations. The spine; is the name given to the bone structure starting under the cervix and leading down to the sacral region. While it helps keep our body stay upright, it also protects the spinal cord that passes through it. The spinal cord is the central nervous system that helps our bodies different organs communicate. The spinal cord, also called "Medula Spinalis" helps us send orders from the brain to the organs, and the reactions back to the brain. All of our movement and senses are performed and controlled by the spinal cord while it also is the control center for all of our reflexes. The spines anatomy is usually examined in three different parts. These are: the cervical, the thoracic and the lumbar. According to embryology, the sacrum is a part of the spine located just under the lumbar and right under the sacrum is the tail bone that originates from the spine but now is an evolutionary surplus. How Does It Happen? When Does It Occur? The most common type is called idiopathic scoliosis, which has no known cause and occurs on a formerly straight spine. It is frequently encountered during puberty (10 -17 years old). Another type of scoliosis that is frequently seen is congenital scoliosis. This form of scoliosis occurs prenatally in the mother's womb and is caused by genetic diseases and complications that the mother goes through during pregnancy and shows symptoms from birth. It can also be seen in spastic children. It may also occur after birth because of diseases such as Polio (Poliomyelitis), brain paralysis and muscular dystrophy (myolysis) which result in the paralysis of the muscles. 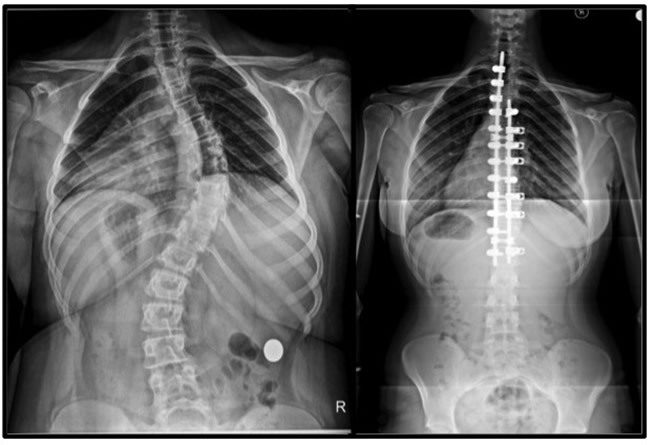 Scoliosis progresses at a fast pace during the rapid growth period throughout puberty. At the ages when bone development is completed and growth stops, the progression theoretically stops as well. Curves at advanced stages may progress during adulthood, but at a very slow pace. The formation of a hump on either side of the back. Diagnosis is made by taking x-rays of the spine at different positions. For further examination, MR and BT scans are necessary. There is still no treatment method that can permanently treat scoliosis at present. Scoliosis is labeled as an aesthetic (physical appearance) disorder but not a disease until the angle of the curve is more than 80 degrees. Until it reaches this angle, scoliosis does not become a vital threat for the child. Treatment depends on the family’s decision and is for aesthetic purposes. However, in cases when scoliosis has advanced to over 80 degrees, it may lead to lung diseases, respiratory problem and organ congestions that may threaten the patients’ vital functions. In these cases, treatment (surgery-operation) is necessary. In essence, the surgical treatment of scoliosis is intended to change an existing deformity that is considered unacceptable (scoliosis) to an acceptable deformity (rheumatoid spondylitis). The treatment is determined by taking into consideration the angle of the tilt and at which phase of bone growth the patient is in. The earlier the treatment is started, the better results it will yield. Physicians may recommend corset use, surgery, or any of these treatments together. There is no need for treatment when scoliosis presents itself with a tilt under 20 degrees but it should be monitored every six months. Exercises that strengthen core muscles can be enough for preventing scoliosis from getting worse. Spinal tilts between 20 to 40 degrees can be kept under control by the use of corsets and exercises. The spine is supported against asymmetrical pressures by the corset and as the patient continues growth, it can be modified to adapt to the body. A corset should be used during late puberty up until bone growth stops. Wearing a corset does not stop scoliosis altogether but slows down its progression. The efficiency of the treatment is not certain. Wearing a corset may lead to skin lesions on children and cause psychological trauma at puberty. Hernia is the general term for the pain instigated when the discs located in between the vertebral bones around the waist region change place. The spine is made up of bones that are attached together and called vertebral bones. Discs are the strong connective tissues, which are placed in between two vertebral bones to offer a soft support and to connect one vertebral bone to the other. Not only do discs provide the ability for the spine to move in any direction, they also act as a shock absorber in between each disk. Discs are located in front of the spinal cord and the nerve roots. Their location is the main cause of symptoms for this disease. Discs consist of rings of a rubber-like texture and a jelly-like nucleus. As the body ages, discs lose their elasticity which makes them less efficient in absorbing shock and more prone to breaking. Hernia is the pressure on the spinal cord and/or nerve roots caused by the jell in the core of the discs after they break. H4 out of every 5 people have suffered lower back pain at some period in their lives. The most typical symptom of hernia is a sudden severe sciatic pain that starts from the middle of the hip and spreads down to the leg. This is a result of the pressure that hernia applies on the nerves. Sneezing, coughing and sitting too much will lead to the increase of the pain. Other symptoms include loss of strength in one leg, paralysis of some movements, tingling feeling, apathy and in advanced cases, overactive bladder. If the patient shows no signs of apathy, loss of strength, or limitation in motion, the hernia is in the beginning phase. In this case, it is recommended that the patient is given medication and bed rest and needs to avoid movements that can be straining on the waist. With Physical Therapy, the core muscles of the body are strengthened to better balance the distribution of body mass, thus having symptoms and pain reduced by decreasing the weight on the disc. Most hernia patients (%80-90) can be treated with physical therapy and certain lifestyle changes, without needing an operation. If there is an increase in pain despite bed rest and medications, and also a loss of strength and feeling in the legs, draining the non-functional discs surgically and relaxing the nerve will be recommended. Microsurgery is the most commonly used technique at present. yphosis is the increased tilt of the spine around the chest when examined from the side. Kyphosis may be caused by various reasons. 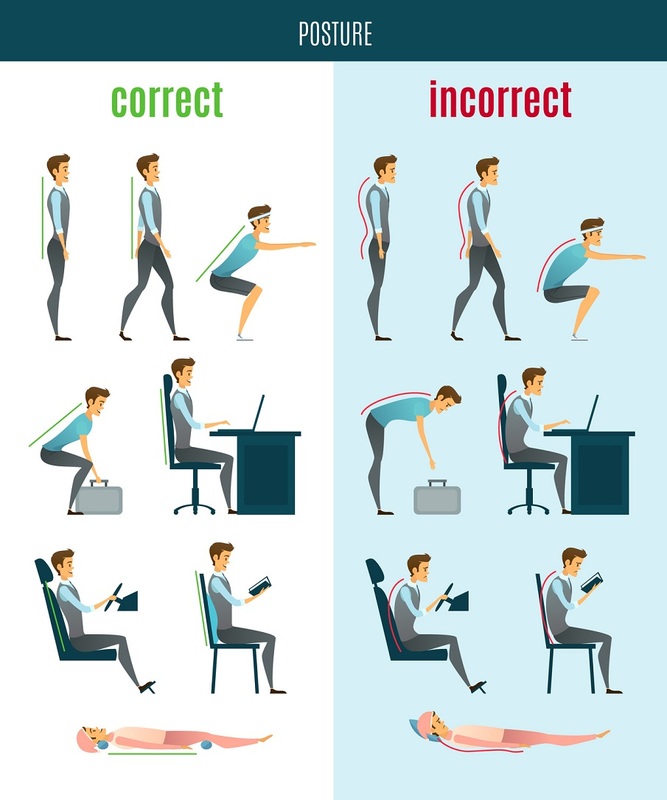 Sitting or walking with bad posture puts stress on the bonds of the spine and this causes the natural tilt of the spine increase with time. 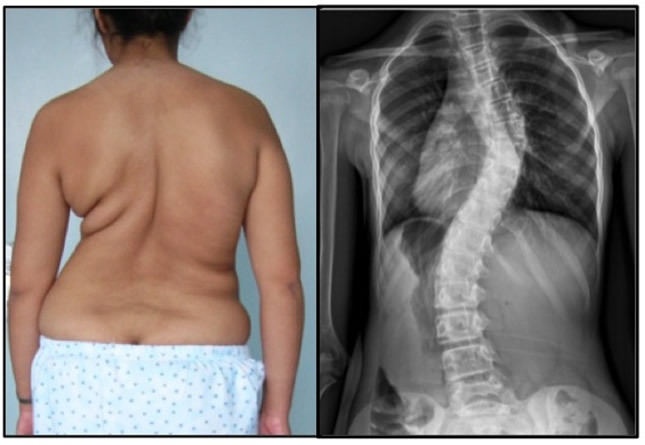 This type of kyphosis generally develops during puberty and pain is rarely observed. In these cases, strengthening the abdomen, back and leg muscles prevents progression, and provides limited improvement. 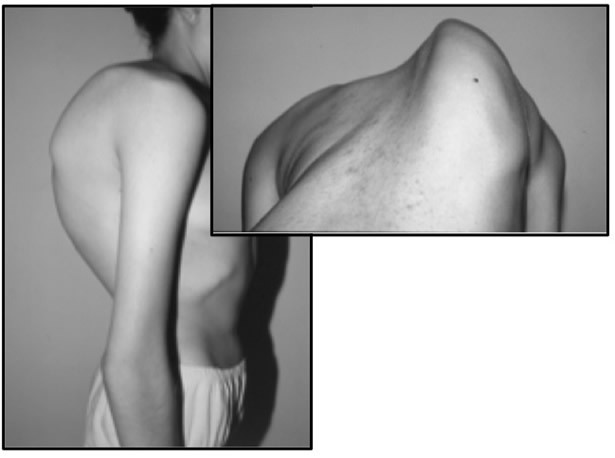 The two types of this disease are Congenital and Scheuermann Kyphosis. InScheuermann kyphosis while the growth of the cartilage in the front of the epiphyseal plate of vertebral bones slows down, the rear cartilage resumes its normal growth. This causes an uneven structure in between the vertebral bones, thus resulting in humps. Similar to postural kyphosis, it shows symptoms around the age of ten. Generally, no pain is observed but it will lead to deformities in physical appearance. By observing x-rays, the difference between postural kyphosis and Scheuermann kyphosis can be observed. When the tilts’ angle extends above 90 degrees, surgical treatment can become an option. The tilt can be straightened and its progression stopped with surgery. Spondylolisthesis is the forward displacement of a vertebral bone. It is frequently seen in vertabral bones in the lower back area. It develops over time. Contrary to the conventional belief, it does not carry the risk of causing acute paralysis. It gradually limits the mobility of a person and rarely requires surgery. Through weight loss, maintaining a proper exercise routine, and adjusting lifestyle accordingly, it can be possible to lead a regular life.